The archetype of the planets manifest in all cultures and religions….this is what shows their reality. West African based Yorùbá religion often scares individuals who are used to religion that is a boring Sunday church service. The deities and how practitioners interact with them may seem foreign and are not easy to grasp, but they have many similarities with the Hindu/Tantric and planetary deities (particularly as they are worshipped in the more traditional and tribal areas of India and Nepal). The African deities are known as Orisha (Òrìṣà). West African Yorùbá religion has spread around the world taking its own flavour based on the local culture. It is called Santeria in Cuba, Puerto Rico and the Dominican Republic, Umbanda, Candomble and Batuque in Brazil, and Vodou in Haiti. All these various forms of West African inspired religion have their own specific variations, but use a similar pantheon which I correlate here for the use of an astrologer. I have no intention to teach any of these forms of African religion, but an astrologer can be more effective when using the pantheon of the client. These correlations allow an individual following an African based spirituality to contact the proper priest in their own path. In Hinduism, if you send a person to a Śaivite priest, he will most likely offer various Śiva remedies for whatever the issue is. In the same way, a Vaiṣṇavite priest will offer the remedies with variations of Viṣṇu. An Astrologers job is to send the individual to the right priest for the most effective remedy. Understanding how the Òrìṣà relate to the planets will allow you to more effectively help practitioners of these West African based spiritual paths. If a person is already an initiate, then talk to them based on their lineage (a little research will go a long way). Be careful how you speak about the Òrìṣà unless you have become familiar with them. Most readings I have done have been compatible and complementary with the Ifá oracles. All standard astrology rules apply; at the time to give remedial measures, just mention what you would normally prescribe as a remedy then share the possibility of working with the corresponding Òrìṣà with proper guidance as an alternate possibility. Speaking with humility and respect will ensure that your guiding gurus and deities and the clients guiding Òrìṣà accomplish the intended goals efficiently. In Indian astrology, the divine singularity of Godhead individuated and manifested as the planets to uphold dharma, they are avatars of a Unitive Oneness. In the Judeo-Christian astrology, the planets were considered Angels who were messengers of God’s will. The planets are not considered ‘Gods’ in the Christianized English sense of the word. In this same way, the West African based religions have a Supreme Being and the various Òrìṣà (African devatās) are the vehicles for manifesting the energies an astrologer perceives in the planets. In the Yorùbá based religions, the Supreme Being takes three primary manifestations: as Olodumare the Creator, as Olorun the ruler of the heavens, and as Olofi who is the active medium between Orun (heaven) and Ayé (earth). This is similar to the levels of Vāsudeva into Saṅkarṣaṇa, Pradyumna and Aniruddha in Bhagavata philosophy. When the Sun is seen as a symbol of the Supreme Being (Brahman) it is associated with Olodumare, the source of our destiny. Then as the Sun is called the sarvātma (the soul of all beings), and manifests as the prāṇa called ātman in an individual being, the vital energy of Olòrún manifests in humans as Ashé. Olofi is the form of the divine that we can interact with and who rules over the Òrìṣà (devatās). 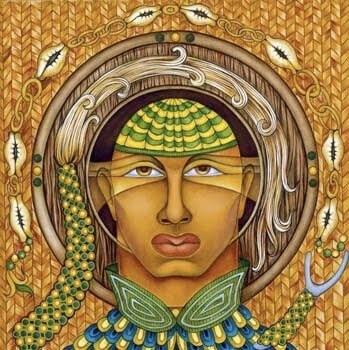 The Sun manifests as Obatala (Obàtálá) or Oxala and is known as the essence of clarity, he always wears white a illuminates truth and righteousness. He is the eldest of all Òrìṣà and creator of human bodies. He is called Alabalase- He who has divine authority, Baba Arugbo- Old Master or Father, and Orisanla (Oshanla)- the arch divinity. Ogunte: In this aspect, she is a warrior, with a belt of iron weapons like Ogun. This path lives by the rocky coastliness. Her colors are crystal, dark blue and some red. Asesu: She is said to be deaf and answers her patrons slowly. She is associated with ducks and still waters. Her colors are pale blue and coral. Okoto: This aspect is known as the underwater assassin. Her colors are indigo and blood red and she is associate with pirates. Majalewo: This aspect lives in the forest with Osanyin, the herbalist Òrìṣà. She is associated with the marketplace and her shrines are decorated with 21 plates. Her colors are teals and turquoises. Ibu Aro: This aspect is similar to Majalewo in that she is associated with markets, commerce and her shrines are decorated with plates. Her colors are darker; indigo, crystal and red coral. Her husband is the Òrìṣà Oshumare. Ashaba: This aspect is said to be so beautiful that no human can look at her directly. Olokun is another Òrìṣà associated with the sea, portrayed as a male in some places and a female in others. The energy is very similar to Varuṇa, in that this Òrìṣà represents unfathomable wisdom and the depths of the ocean. He is depicted as royal, stern, and yet deeply spiritual and meditative. He plays a role of helping humans being pass into the realm of the ancestors (Eggun). Mars manifests as Ogum (Ogun) Lord of Metals (specifically iron), Minerals, Tools, War, hunting, wild beasts, accidents and war. He can be aggressively masculine and is associated with blood, and so is often called on to heal diseases of the blood. His weapon is a machete, and he is associated with other iron made weapons. Oxossi (Oshosi, Ochosi, Ososi, Oxosi, or Osawsi)is similar to aspect of Mars. He is associated with jail, justice and those who are persecuted. He is a magician and his name literally means “the one that works with witchcraft’ just as Mars is called mantra-abichāra-kuśalī. He is a solitary figure in the wilderness, a hunter and a shaman. He carries a bow and arrow and is connected with the hunter communities. 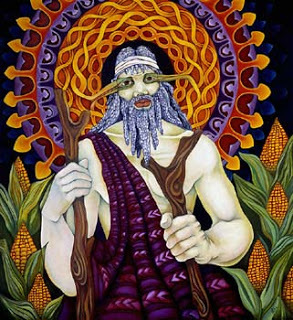 Oxossi is known as an ally of the nature spirits (caboclos) of the forests, and in this way, he plays a role similar to the Shiva who is seen as a recluse in the forest. Mercury manifests through Èṣù or Exu, Echu, (Elegua, Eleggua, Elegbara, Elegba, Legba, Papa Legba and Eleda). He is Olurun’s linguist and the master of languages, therefore he is the messenger. He is related to crossroads, gateways, new endeavours and called the Opener of the Way. He is the Òrìṣà of chance and unpredictability, and is known as a trickster. He is also said to assist in enhancing the power derived from herbal medicines. Èṣù is from Brazilian Umbanda, Eshu is from Santería Lucumi and Legba is from the Haitian Vodou tradition. The names are correlated here, but the particular forms of these Òrìṣà do vary in their perspective culture. Each also has many forms (called paths), , like the Elegua of the river, the Elegua of the house, or the Elegua of the road. Each form has variations, different attire and offerings within the traditions. So there is not simple ‘here it is’ to understand, and so it is important to remember that this is a guide to the surface, only to direct a client of this practice to the proper priest who can assist them. The consort of Èṣù is known as Pomba Gira by the practitioners of Umbanda and Quimbanda in Brazil. She is a beautiful woman who personifies female beauty, sexuality, and desire. She is connected to woman and gay worshippers and invoked for matters of love. There are many additional Òrìṣà, like Aja, patron of the forest, the animals within it and herbal healers. She is the teacher of the herbal arts and can be associated indirectly with Mercury (or Dhanvantri). Jupiter manifests through Orunmila (Orula, Orunla) who is the Yorùbá Grand Priest. 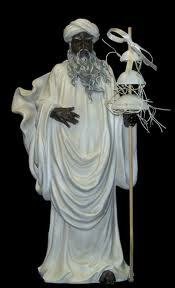 He is referred to as Agbonniregun, the embodiment of knowledge and wisdom. 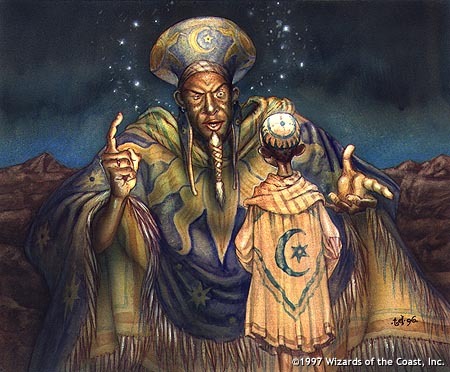 He is associated with divination, called Eleri Ipin (witness of fate) and custodian of the Ifa Oracle. Just as Jupiter is the greatest benefic, Orunmila is praised as being more effective than other remedies. He is associated with the ekuele (rosary or mala) and his mala is made of yellow and green. Like Jupiter, he is associated with wood and a cedar tray is used in his worship. Also, Ṣàngó (Xango, Xangô, Chango , Shango, Xango, Sango) is the Òrìṣà of the thunderbolt. He is a very famous Òrìṣà in the west. He has been associated with Mercury by some, but his external attributes resemble more Paraśurāma (Venus Avatar) in the Hindu Pantheon. He was a warrior king (immortalized fourth king of the Yoruba) whose symbol is the double axe (paraśu), exactly like Paraśurāma. Yet, his qualities relate to Indra as Adidevatā of Jupiter. Ṣàngó is associated with masculinity, virility, lightning, stones and is invoked by those seeking justice similar to the Vedic invocation of Indra. His function is to lay the foundation for an individual to find and follow their dharma. 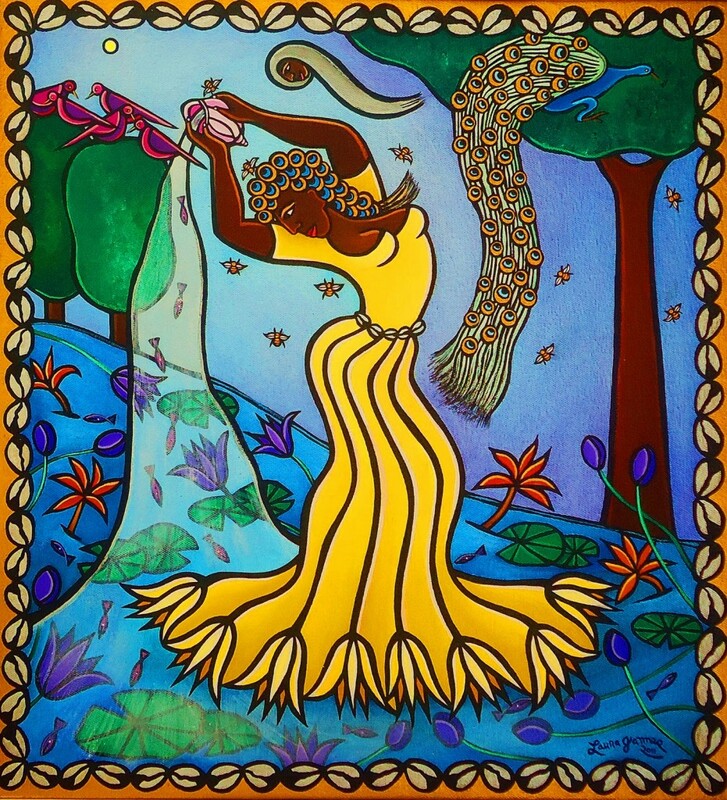 Venus manifests as Oshun (Ochún or Ochun) aand is portrayed as a beautiful woman in a yellow dress. 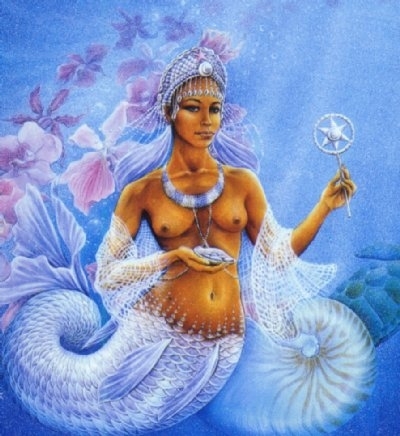 She is the Òrìṣà of fresh water and associated with the cosmological forces of water, moisture and the flowing motion. She is the Òrìṣà of love, beauty, attraction and sexuality. She is associated with dance and often portrayed as dancing erotically. She rules marriage, fertility, control of the feminine essence, and is prayed to for the alleviation of female disorders. Saturn manifests through Omulu, the Lord of Death and Disease. He is invoked when someone is sick in order to get a cure. He is also known as Babalu Aye (Babaluaye). He relates to disease and specifically epidemics. He was originally concerned with smallpox, but is presently being invoked to deal with influenza, leprosy and HIV/AIDS. He punishes with illness and rewards with health. He is called the “Wrath of the supreme god” as it’s his job to punish transgressions. Like Saturn, his leg is lame and he undergoes a time of exile from society for breaking social contracts. He shows the space of falling to a low point and then rising back up. 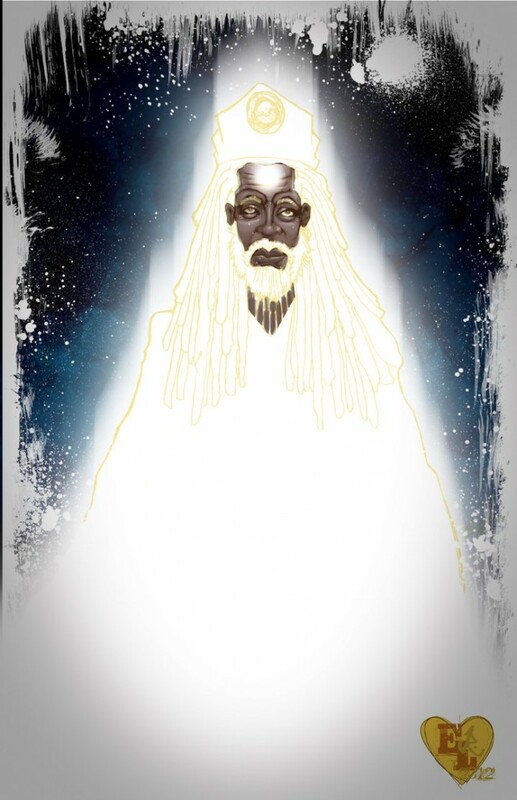 Rāhu manifests through Oduuwa (also called Oduwa, Oodua, Odudua or Eleduwa), who is the rival to the solar energy of Obatala. 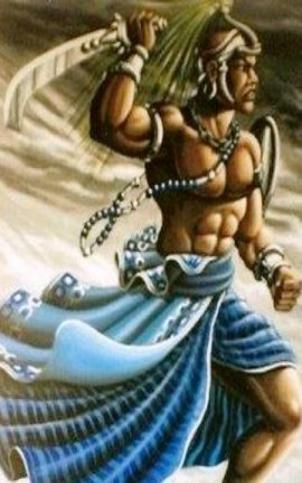 He is Obatala’s younger brother who usurped his position and took the means to create the Earth on the primeval ocean. The feminine energy of Rāhu (similar to Chinnamasta or Vajrayogini) manifests through the form called Oya (Oiá, Iansã, Iansan). She is the Òrìṣà of wind, thunder, magic as well as the commotion of the marketplace. She represents the chaos of the storm, and sudden and drastic change. She is connected to rebirth, a facilitator of transition and a protector of the cemetery gates. She creates hurricanes and tornadoes (her whirling dress as she dances) and is often shown with her husband, Ṣàngó, who is the of Òrìṣà lightening. She is depicted with large open eyes, colourful clothing, a horse’s tail and can transform into a water buffalo. Ketu is connected to the spirits of the dead, called the eggun. It is believed that the ancestors have the responsibility to invoke the ethical standards of the clan’s past generations. 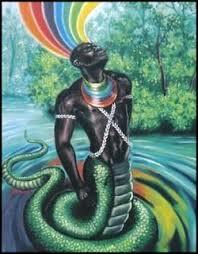 Ketu is also the rainbow serpent (called Oxumaré or Òsùmàrè). The rainbow serpent controls the forces that direct movement, indicates mobility and change, and is the lord of elongated things. Òsùmàrè relates to the umbilical cord and our connection coming into this world. It represents a link between our world and the world of the ancestors, and is often involved in facilitating communication between various realms of existence. Òsùmàrè also rules the change of sexes, and is sometimes considered male half the year and female half the year. There is a metaphysical concept called Ori which means the “head”. It is that aspect of oneself that indicates one’s intuition and destiny. This is sometimes personified as an Òrìṣà itself. This will be seen astrologically as the lagna/lagneśa. West African based spiritual paths work with the Òrìṣà to create a balanced character (iwa-pele) and life so that one can come into alignment with their Ori. Alignment with the Ori allows you to live in alignment with what is good for you and avoid what is not. It brings inner peace and satisfaction with life. The Òrìṣà connected to the planet ruling the lagna can be used to create a balanced character (iwa-pele) and life so that one can come into alignment with their Ori. Syncretism is the merger or blending of various beliefs and practices based upon an underlying unity, when not fully integrated it is eclecticism. We see syncretism has been in practice since the time of ancient Egypt where various gods were merged when they had similar functions. This was continued by the Greek and Romans when they merged the gods of conquered lands with their own. The Greeks tried to understand the gods of other cultures by comparing them to the characteristics of their own gods in a method called Interpretatio graeca. In India astrology there is a slightly different approach. As India is a land of many religions and many forms of gods, there is not a desire to make another culture’s gods fit into any of the various pantheons. But there is instead a concept of kārakas (causal structures or archetypes) that frame everything that manifests. The root causal structures relate to the traditional seven visible planets and the nodes of the Moon. In Indian astrology, these causal structures or root archetypal energies indicate the functions of the various forms of the deities, but these deities manifest according to the deśa (place), kāla (time), pātra (person). I will use a simple analogy of a shoe-maker to explain this concept. A shoe-maker in India, a shoe-maker in Brazil and a shoe-maker in Europe make very different types of shoes. They are not the same shoe; in India it may be a sandal, while in Europe it may be a boot. The boot and sandal are both archetypally shoes (things to protect the feet); they have the same functions but manifest according to the nature of the country/culture, the time period (2020 verse the year 1850), and the person (someone brought up in a poor Brahmin family compared to a rich Christian European family). The causal structure would be the shoe needed for foot protection, but the manifestation varies as a sandal or boot. In this way, the planet is the causal structure not the god itself. To Śaivites, the Sun is Śiva. To Vaiṣṇavites, the Sun is Lord Rāma. To Kālī worshippers, the Sun is Mataṅgī. There are also many more variations of the Sun, but the point is that when we relate the Orisha to the planets, we are not syncretizing them. We may be doing an Interpretatio indica, to be able to relate them to the core archetypal energies, but they are respected as individual deities, not seen the same as, but seen as having the same function. Just as you and your sibling are individuals, even though you came from the same parents, the goddess of love will manifest differently to Indian culture and African culture and European culture. Just as the trees and plants and geography varies from one country and climate to the next, the deities have a different form. And just as different herbs will have different effects, the worship of different deities (even though serving the same function) will have slightly different results.